A few years ago, we watched in disbelief as a group of anglers pounded the trout left and right using something similar to a mini jig, yet way more effective! 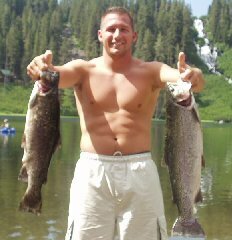 These trout weren't just any trout...they were massive pieces of flesh weighing in excess of 10-17 pounds each! This group of men continued to hammer the trout week after week and consistently showed off massive stringers of fish. It wasn't long before we had to find out about their secret bait. A small plastic worm called the Trout Worm was responsible for the destruction of such obese trout. We quickly switched over and ever since have out fished fellow anglers even footsteps away. We then took the Trout Worm one step further and used a special combination of chemicals to produce an extremely soft and lightweight plastic that will keep you in the strike zone more often, therefore, increasing your chances at catching fish...Add 7 new fluorescent colors to the mix, and now you have a bait that blows its competition out of the water. Its not uncommon to have 30+ fish days while others are struggling to even hook up. 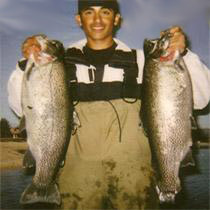 Trout worms are the hottest bait to hit the market in years and continue to dominate waters across the world. Below is the gear recommended to increase your success rate. Lite or Ultra Lite action fishing rods. Top three rods for fishing trout worms are Phenix, Kencor, and G Loomis. Rods in excess of 6 foot are highly recommended in order to "feel" the worm and detect bites at all times. Place small bb or 3/0 sized split shot approximately 2-3 Feet above a Size 8 or Smaller Hook. Don't forget to crimp the weight on tight to prevent it from slipping down while casting. Thread your Trout Worm onto the hook. The bend of the hook and the barb should be exposed while the rest of the hook is hidden inside the worm (as shown above). Cut Trout Worm in half and thread it onto a 1/32 or 1/16 ounce minijig/tubejig/crappiejig/fingerjig. The trout worm gives the jig an erratic action and drives the trout nuts. Tie a Size 8 or Smaller hook onto your line and leave approximately 6 inches to 2 feet of excess line hanging from the hook. Now clamp on a bb or size 3/0 split shot big enough to keep the bait on or near the bottom. This technique is great to use when the split-shotting method is getting hung up on underground weed beds or similar structure. Now comes the most important aspect of fishing trout worms. 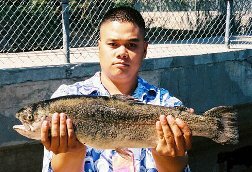 Cast out Trout Worm and let it sink until it is in the lower half of the water column. Close your bail and start giving the worm action. Point your rod tip up and start bouncing your rod. You want to raise and lower your rod tip at a medium to fast pace. At the same time you are bouncing the rod tip, reel in very slowly. Just enough to keep the slack out of your line at all times (with slack you cant feel when the fish bites). Repeat this action and you will be on fish. While split shotting your trout worm, a bite will feel just like you are stuck on the ground. For some reason, the fish eat the plastic and sit in one spot. Once you feel a snag or feel any type of resistance...set the hook! Merely lifting the rod tip up high will normally do the trick but many prefer a more violent yank. Fishing bait is fun but nothing like fishing a trout worm. Once you have your first hookup you'll never look back. If you have any questions/comments on how to fish Trout Worms feel free to email me at sales@lipripperz.com. When the hook is in the worm is the line also? I have never threaded the hook down into the tail of the worm. The trout worms are only 2.5-3" long, so threading the hook into the head of the worm should be sufficient. In my experience, the trout usually inhale the worm and I've yet to have a problem with being bit short with a trout worm. Thanks for the info will try these this weekend. I really like the rip lipper product line. I actually rigged wacky style 1st time using the trout worms at DV and had a productive day off the east dam.